ELMO USA Corp., a global leader in education technology for over 45 years, adds the NEW MX-P Visual Presenter to their lineup. The MX-P is the latest in ELMO’s 4K Portable MX series of document cameras and delivers the smoothest true-to-life high-quality image with no delay. It is the first document camera on the market capable of 16x digital zoom at 4K resolution, capturing true 4K at 30fps or full HD at 60fps. With an output terminal offering HDMI, RGB, and USB Super Speed 3.0, MX-P seamlessly connects to a wide array of devices. The MX-P has a lightweight and foldable body, and its easy setup makes MX-P the perfect solution for presentations on the go. 4K Resolution – The MX-P is the first camera on the market to offer 16x digital zoom at 4K resolution, capturing video in True 4K at 30fps or Full HD at 60fps without any loss of quality. Multiple Outputs – MX-P comes with SuperSpeed USB 3.0, HDMI, and RGB/VGA outputs to connect seamlessly to a wide variety of devices. Flexible Structure – The camera’s flexible structure allows it to be angled in any position need so you can capture images and record videos however you want. Portable – The MX-P only weighs 1.2lbs and is 1” thick when fully folded, making it perfect to take with you for on-the-go presentations. MX Writing Board – Pair the MX-P with ELMO’s MX Writing Board for dry marker surface during presentations. 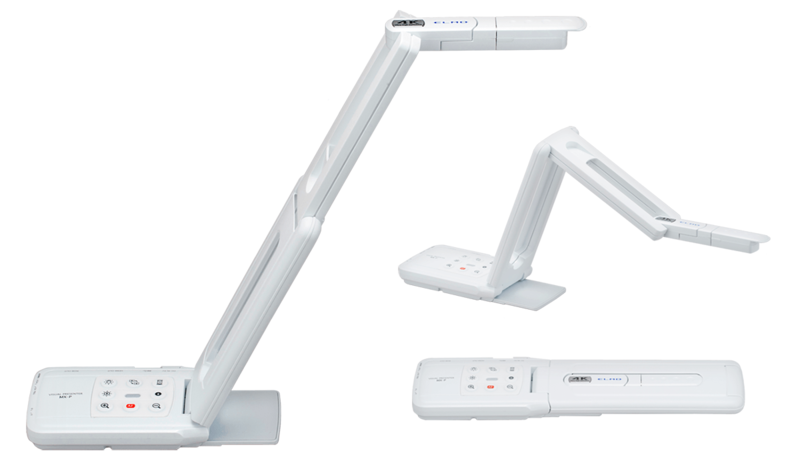 Specially designed for the MX series of ELMO document cameras, the Writing Board has a unique matte surface reduces camera glare and is easy to erase. The MX-P Visual Presenter will be available Summer 2018. For more information on the MX-P, including product features and specifications, you can download the MX-P product brochure.